Is it? Am I? If so, I’d like to have someone go real slow on the explanation to me, please. 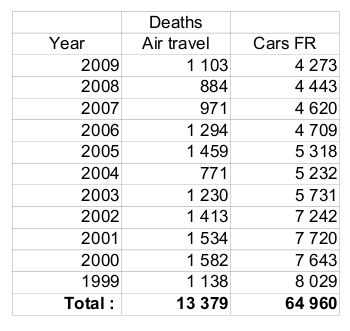 Allow me to make some observations: In 2009 (full stats for 2010 not yet available to me) the world registered 1,103 deaths in airplane transport. This includes airplanes from eight passengers and up. That same year we had 33,808 deaths on the roads – in the US only! Forget India, Nairobi or France. That’s 75 Boing 747 planes! They can’t make new planes that fast. 75!? – that’s six full planes per month. Note how 2009 is the best year yet for road accidents. But what is really scary is that over a ten year period we manage to kill almost half a million of our fellow citizens. And six times that number are injured. Many to a degree where their life is changed for the worse. Permanently. In comparison, ten years of armed conflict in Afghanistan has cost 2544 deaths – for all coalition partners combined (2001-2011). But there are differences in the two transport systems that makes them incomparable, you say. For one there ain’t much up there. No crossing pedestrians, no stray balls from the playground. And not much in oncoming traffic either. It’s all smooth cruising on a freeway. Compare with deaths on the interstates. To begin with, I’m sure there’s a couple of air traffic controllers out of O’Hara who’d like to pitch a remark or two on there not being much congestion up there. Congestions at hundreds of miles an hour they’ll tell you. And as for “stray balls” they have a fine collection of tales involving single-engine Cessna’s happily strolling into landing and take-off corridors. According to “FARS” (the fatality analysis reporting system of NHTSA) almost 20% of all fatalities occurred on roads with speed limit of 60 mph or higher. If we can assume that that means controlled access roads with traffic in one direction only (no crossings etc) then we should be comparing (for 2009) 20% of 33,000 = 6,600 deaths with the 1,103 deaths of world wide air traffic. Sounds good? In the US we only kill six times as many people, on the safest type of road we have yet made, than world wide air traffic does. Including traffic by all the black listed companies, of which there are currently 285. Every day! Xmas and the 4th of July included. Most of us know all this – at least in broad terms. But we are not getting the least agitated. Are we like lobsters slowly warming up to ever higher degrees of indifference. Is our apparent high tolerance on just how violently we can live together having a broader impact on our behavior? And are we all stone hard hypocrites when we show affect over the latest plane crash? Or yesterday’s four casualties to a roadside bomb outside Kabul? As I said, I don’t get it. Either we should focus and do something serious about that daily carnage taking place on our roads or we should carry on with the low-budget approach we have had for decades (there are improvements to be sure. Incremental improvements that is). But in that case please don’t put on a display of emotions when the next plane meets mother earth a bit too enthusiastically. Interesting stats (and these guys should know: Their business depends on it) on the odds of dying: In any one year in the US you are 1:6856 against getting killed in a road accident. In your lifetime you have no better than 1:88 against. Travel by air and your odds are 1:547801 and 1:7032 respectively. I’ve often pondered on why fear of flying seems to be so widespread compared with fear of driving a car. Maybe because most of us drive cars more often than we fly? That thought leads me to think that if we drive cars much more than we fly that could explain why we see so many more deaths by cars? I think your article would benefit from discussing this too. Is there any statistic available that can answer this question? Actually there’s a truckload of stats – with all manners of metrics used. I have included some of them as links at the bottom of the post (above). However, I wouldn’t want to get too involved in the discussion of which metric makes the most sense. Or speaks the cleanest “truth” … What I wonder, regardless of what is safest, is why it is we seem to develop a certain emotional numbness when deaths arrive in a small stream rather than one “large” punch. The adjective in quotes to indicate (as per the post) that, actually, the small streams of deadly accidents on our roads every day, add up to a whole lot more than all plane crashes combined. To me it’s not about arguing over deaths/passenger-mile or /vehicle-mile or any of the several other metrics. It’s about our acceptance about the most common mode of transport being inherently dangerous. Apart from airbags and crash absorption zones, shouldn’t it be possible – in the 21st century – to advance matters beyond “what can be done to save the occupants now that disaster is definitely inevitable”? 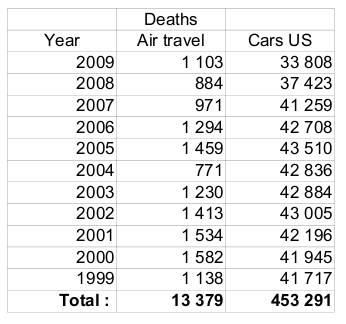 And this is just about cars versus airplanes. Try to look at the odds of dying if your means of transportation is a motorcycle or scooter……probably 15 times higher on a per passenger mile basis. That would qualify as a death-wish.